Sure, in today’s media landscape the existence of the humble newspaper reporter might soon seem as mythical as the Easter Bunny, but no one dares ruin the gung-ho belief in print journalism of 9-year-old Hilde Kate Lysiak. 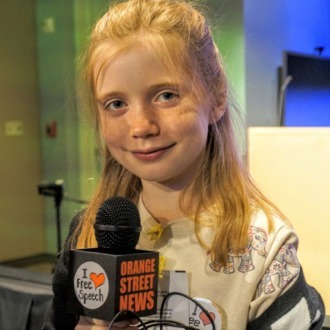 Lysiak, who, with the help of her journalist dad Matthew Lysiak, runs her Pennsylvania town’s only local newspaper, the Orange Street News, has now been tapped by Scholastic to pen a four-book series. In the past, the pint-sized sleuth has covered everything from fluff pieces catering to her readers (important ice cream news!) to hard-hitting investigations into nearby tornado damage and murder scenes (really) in her monthly newsletter and blog. While Lysiak’s father is in charge of editing and typing the newsletter, Hilde takes to her bike to chase down leads — she even has DIY press credentials. The book series, Hilde Cracks the Case, will follow a kid detective and will likely take place in Hilde’s real hometown of Selinsgrove, because there’s no way a book publisher could come up with a small-townier small-town name than that.